Any enemy of the Yankees is a friend of mine. Nothing personal, just normal blood feud stuff, you know, like the Montagues and Capulets, Bloods and Crips, Mac and PC. Last week, the Rangers eliminated the Yankees, so in this World Series I can freely root for both sides. I grew up in a Red Sox household in the middle of Connecticut, almost midway between New York and Boston. This meant that every day of my life, I endured the incessant put-downs of those fortunate enough to have been born of Yankee parentage. This was the era of Mickey Mantle and Yogi Berra and Whitey Ford. I think after Ted Williams retired, Eva Gabor was the power hitter for the Red Sox. What you are looking at is the equivalent of my Mount Rushmore, Statue of Liberty, Washington Monument, and tribute to the guy who invented peanut butter combined. 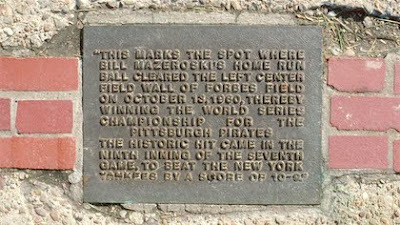 On the site of the old Forbes Field in Pittsburgh marks the spot where Bill Mazeroski's winning home run landed in the ninth inning of the seventh and deciding game of the 1960 World Series between the Pirates and Yankees. This was the Yankees tenth World Series in twelve years, the Pirates first since getting pummeled by Babe Ruth and the Yankees' infamous Murderers Row in 1927. Again, the underdog Pirates were hopelessly outgunned. After squeaking out an opening victory of 6 to 4, the Yankees unequivocally reminded the Pirates who was boss in the next two games with scores of 16 to 3 and 10 to nothing. Then the Pirates squeaked two in a row - 3 to 2 and 5 to 2 - only to be bombarded by the Yankees in the sixth game by a score of 12 to nothing. If this were five-day cricket, the Yankees would be leading 46 to 17. Instead, the Series was improbably tied at three each. It all came down to the final game. This time, at home, the Pirates mustered the necessary firepower. Trailing 7 to 4 after seven innings, they banged out five runs in the eighth to take the lead. But the Yankees tied the score in their turn at bat in the ninth with two more runs. Home run! Home run! Home run! The Pirates win the Series! Forbes Field instantly erupted into what was then the loudest spontaneous human-generated sound in recorded history. Mazeroski headed into second, whipped off his cap and swung it round and round in celebration. As his teammates mobbed him at the plate, the Yankees on the field simply stood in their positions in postures of shock and disbelief. This is the eighth in my series based on talking points raised by Robert Whitaker's eye-opening "Anatomy of an Epidemic." Continuing on from yesterday. As you recall, I began my piece with an American Psychiatry Association annual meeting I attended in San Francisco in 2003. During the meeting, I happened upon a street demonstration of psychiatric survivors brandishing "Psychiatry Kills" and similar signs. A few months later, six individuals associated with MindFreedom staged a sophistic public display that boiled down to challenging the APA to prove that mental illness existed, with demonstrable biological causes and effects. Robert Whitaker in "Anatomy of an Epidemic" cited the MindFreedom campaign with approval, noting they had "won this battle." In yesterday's piece, I corrected him. In fact, nobody won. Rather, we all lost. It works this way: When the loudest in our midst are in denial about the reality of mental illness, we simply don't get decent funding for its research and treatment. The funding goes to illnesses whose patient populations have their act together. 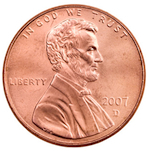 Thus, for every dollar the NIH spends researching HIV/AIDS per patient, depression and bipolar get one penny. One penny. In Sept 2006, a friend took me to a function at a drop-in center in Berkeley, CA, organized by antipsychiatry activists. The meeting started with everyone in the circle, myself included, introducing themselves. One guy bragged how he spearheaded a drive to outlaw ECT in Berkeley in the 1980s. You’re actually proud of that? I wanted to say. If you had actually followed me indoors rather than made noise on the streets, you might have actually learned something. The speakers inside actually addressed the questions the MindFreedom people had posed, in a nuanced way that totally challenged the thinking of everyone in attendance. So much so that three years later in Berkeley my head was still spinning. At the APA, I heard Daniel Weinberger of the NIMH report on a 2002 study I have mentioned many times in this blog and elsewhere. The study linked a certain gene variation to the fear response in the amygdala in the brain's limbic system. For possibly the first time, we had a connection between a gene and emotion. This is not the same as saying we have a connection between a gene and a DSM mental illness. Critical distinction. At about the same time, a study on a birth cohort in New Zealand found that those with this exact same gene variation had a much greater tendency to become depressed when exposed to certain stressful situations such as financial difficulties. Again, this is hardly the biological causal link that MindFreedom was demanding. The brain is way too complex to yield those kind of pat answers. What these and numerous follow-up studies showed in essence was that bad things tend to happen when a biologically vulnerable brain is exposed to stressful situations. It's an old theory, but now the brain science was beginning to validate it. No one talks about genes and biology in a vacuum anymore. 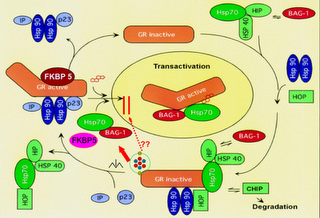 It's all about the how genes and biology and environment interact. At another session, I heard Robert Freedman of the University of Colorado tell a demonstrably appreciative crowd that "genes do not encode for psychopathology." In other words, forget about finding a depression gene or a bipolar gene or a schizophrenia gene. Dr Freedman is a pioneer in "endophenotype." He wondered why those with schizophrenia craved cigarettes. He discovered a variation in a nicotinic receptor gene that may account for this, that had to do with "auditory gating" that plays a major role in tuning out distracting noises. Ah, if we could only tune out the distractions. Again, hardly a direct biological causal link to a specific mental illness, which was Freedman's very point. The brain is not organized according to the DSM. That's one reason "depression," "bipolar," "schizophrenia," "anxiety," and so on are at best rough guides. Two individuals with bipolar, for instance, may not even have the same symptoms in common. But they are both likely to have messed up sleep. So let's investigate the messed up sleep and see if that will give us insights into why we find ourselves too depressed to get out of bed in the morning. Then, maybe, we can come up with specific treatments that address our real problems rather than stupid one-size-fits all remedies that fit only a lucky few. Assuming we get some decent research funding, that is. That's why "chemical imbalance" of the brain doesn't begin to tell us what is going on. Whitaker very elegantly debunked that particular myth in his book, along with the fallacy of treatments to correct this chemical imbalance. An antidepressant to treat depression? It's a stupid idea if we persist in thinking a depression is a depression is a depression. So far so good. But then Whitaker mistakenly assumes that because the chemical imbalance myth is wrong then the whole premise of psychiatry is wrong. Whitaker not so implicitly takes this further: If psychiatry is wrong, then antipsychiatry has to be right. The problem is there is no nuance to antipsychiatry. Its spokespersons deny that mental illness exists in the first place, along with the possibility of finding treatments, which explains why everyone at the meeting I walked into in Berkeley talked about their experiences in making noise rather than helping people. What is really going on is that the whole premise of psychiatry is changing to a point where it may not be called psychiatry anymore. The smart thinkers in the field know that the biological psychiatry/disease model of behavior is long past its sell-by date, and that a new science of the mind is taking its place, even if this is not readily apparent at street level. That is what I observed inside the APA annual meeting in San Francisco in 2003. I wish some of the protestors outside could have followed me in. I wish Whitaker could have followed me in. If Meds Work as Well as Our Psychiatrists Tell Us, Why Do We Have MORE Mental Illness Today Rather Than Less? This is the seventh in my series based on talking points raised by Robert Whitaker's eye-opening "Anatomy of an Epidemic." In late April or early May 2003, I was in San Francisco for six days of the American Psychiatric Association's annual meeting. Two or three days into the conference, as I was making my way across the street from the north complex of the Muscone Convention Center to the south, I came upon an organized demonstration of psychiatric survivors brandishing "Psychiatry Kills" and similar signs. Their personal experience certainly justified their outrage against psychiatry. An earlier generation was subjected to the horrors of captivity in state institutions. A later generation experienced a different type of abuse in the form of the bad practice of medicine, often applied in a not so subtly coercive "take your meds and shut up" environment. But I was here to find out what was going on inside the Muscone Center, not outside. I waited till the marchers passed, then made my way to my next round of listening to very smart people talk real fast in dark rooms. Among other things, the MindFreedom group asked for evidence proving that major mental illnesses are "biologically-based brain diseases" and for any evidence that "any psychiatric drug can correct a chemical imbalance" in the brain. The six individuals threatened a hunger strike unless one of the organizations served up the evidence. The APA through its medical director wrote back that "the answers to your questions are widely available in the scientific literature, and have been for years," then suggested a textbook and the Surgeon General's 1999 Mental Health report (which ironically stated "the precise [etiology] of mental disorders are not known"). The Six went on their "fast for freedom," which lasted till medical complications broke out. Then they issued a press release stating that the APA, NAMI, and "the rest of the psychiatric community" were indifferent to those "who would deny that serious mental disorders are real medical conditions ..."
It was clear to all observers who had won this battle. The strikers had called the APA's bluff, and the APA had come up empty. I'm glad Whitaker saved this account for the last chapter rather than the first. Otherwise I would have tossed his book in the trash. Clearly - unless you subscribe to Thomas Szasz - the biology of the brain influences behavior. We think with our meat (thanks, Terry Bisson, for the metaphor). We feel with our meat. We perceive with our meat. And when our meat malfunctions bad things happen. It doesn't matter what you call it, bad things happen. If psychiatry is stupid, then the antipsychiatry response is equally, if not more spectacularly, stupid. You don't fight stupid with stupid. If gay activists had been in denial about a mysterious phenomenon that was decimating their population back in the eighties, there would have been minimal funding for HIV/AIDS research and treatment. In fact, at the very beginning of the epidemic the gay population was in denial. Then they got smart. They got loud. They literally intimidated the government and medical establishment into action. In 2009, the NIH allocated $3.19 billion for HIV/AIDS research. By contrast, research for depression (including bipolar) was a mere $402 million. Million, not billion. These are ratios that have held fairly steady over the years. Approximately 1.5 million individuals in the US are affected by HIV or AIDS. About 19 million in the US in any given year deal with depression or bipolar. That translates to the NIH spending $2,013 per patient for HIV/AIDS research vs a paltry $21 per patient for depression and bipolar. Putting it another way, for every dollar the NIH invests in an HIV/AIDS patient, depression and bipolar patients get one penny. One penny. That's the value the government and medical establishment places on our lives, in large part based on the stupid and in-denial showboating advocacy that Whitaker so enthusiastically endorses. No, Whitaker, no one "won" that battle. We all lost, bigtime. If the loudest in our midst are denying that mental illness exists, then why fund its research and treatment? Obviously the people responsible for funding things have asked themselves that very same question. Don't get me started. This is the sixth in my series based on talking points raised by Robert Whitaker's eye-opening "Anatomy of an Epidemic." Yesterday, I reported on a study by Martin Harrow and Thomas Jobe featured in Robert Whitaker's "Anatomy of an Epidemic." The study tracked 64 young patients with schizophrenia from two Chicago hospitals over 15 years. An eye-popping finding was that 40 percent of those not on antipsychotics were in recovery vs just five percent of those taking antipsychotics. In their study, Harrow and Jobe did not address the efficacy of antipsychotics in the long term. That would have required an entirely different study design. Rather, Harrow and Jobe sought to tease out subgroups of unmedicated patients who "may show adequate functioning or recovery" over time. The authors were coming from a fairly mainstream point of view, namely: Schizophrenia (or any other mental illness) has many different causes and effects and manifestations across broad populations. Consequently, one-size-fits all treatments are likely to fit very few. Unfortunately, the psychiatry we know is at the one-size-fits all level, which is the best explanation for why so many patients taking meds get worse rather than better. Psychiatry also wrongly assumes that the same meds and dose levels that work in getting us out of crisis are the same ones that will get us into recovery. We hear much about evidence-based medicine, but this is sadly lacking in psychiatry. Long-term drug trials that actually tell us something are very few and far between. Clearly, it would help if psychiatry could predict on which specific populations meds are likely to work, especially over the long haul, but Pharma has no financial interest in running its clinical trials that way. Likewise, it would help if we knew which patients were likely to do better NOT staying on their meds, which is what Harrow and Jobe looked into. Specifically, they asked: 1) Can patients not on antipsychotics function well? 2) Which particular groups go off their meds and how does this influence outcome and recovery? 3) Are there various developmental, prognosis, and personality factors that enter into consideration? In other words, is a patient with a prior work history who is not inclined to attribute his or her circumstances to bad luck, who is showing signs of improvement on their antipsychotic, a possible candidate for weaning off their antipsychotic? Yes, sort of, conclude the authors. In their own words: "The data indicate significantly better functioning for the patients not on antipsychotic medications." This finding literally turns psychiatry on its head, but it hardly tells the whole story, as the authors note. The finding needs to be read with the study's other main finding, namely: Nearly half the patients not on antipsychotics at the end of the study had "favorable prognostic indices" when hospitalized 15 years earlier, in contrast to little better than one in ten patients still on antipsychotics. Patients who are internally orientated and have better self-esteem are the types of patients who are more likely, if their functioning improves, to urge that they try functioning without medications and/or to choose to try functioning without any treatment at all. The current data suggest that for the select subgroup of patients with schizophrenia who are not in clinic settings, who have gone off antipsychotics and did not immediately relapse, and stayed off them for a period of time, a surprising number experienced periods of recovery and continued to function well for a considerable period without antipsychotics. Clearly, the present longitudinal data suggest that not all patients with schizophrenia need to use antipsychotic medications continuously throughout their lives. Obviously, a lot more work needs to be done to zero in on this particular group of patients. A 40 percent recovery rate for schizophrenia patients not on meds is clearly an astounding finding, one that offers hope to a good many. But that same figure also indicates a 60 percent failure rate. And until we find out more, going off meds is going to be as risky, it seems, as staying on meds. The bottom line is we're still flying in the dark. Thus the critical need for follow-up studies, to build on the work of Harrow and Jobe and others. Sadly, this is not likely to happen. Longitudinal studies are extremely difficult to get off the ground and sustain, and the NIMH - just about the only available funding source in the US - is not a bank. Thus, the Harrow-Jobe study is all we are likely to have for years to come. This means, instead of a progressive train of enquiry yielding a steady stream of answers, we will continue to be asking questions. This is the fifth in my series based on talking points raised by Robert Whitaker's eye-opening "Anatomy of an Epidemic." A lot of us have heard the story before, but it strongly bears repeating: In 1969, WHO began tracking schizophrenia patients in nine countries. At the end of five years, those in three developing countries - India, Nigeria, and Columbia - had "considerably better course and outcome" than patients in the US and five other developed countries. Fluke finding? Bad methodology? In 1978 WHO launched a second study tracking mainly first episode schizophrenia patients in ten countries. The results vindicated the first study. After two years, nearly two thirds of those in the developing countries had good outcomes vs those who were chronically ill. This was virtually the exact reverse of how the patients fared in the western world - 37 percent with good outcomes, 59 percent chronically ill. According to the researchers: "Being in a developed country was a strong predictor of not attaining a complete remission." Follow-up interviews conducted in 1997 with the patients in these two studies found that 53 percent of those in the developing countries were "never psychotic" again, with 73 percent employed. Could it be that those in the less developed world have the type of supportive families and communities that prove protective against the stresses of daily living? Or, flipping it around, would it be safe to say that modern society literally sets us up to fail? In a crazy world, where we are subjected to crazy demands with no wiggle room, it's only logical that our rates of mental illness will be higher and rates of recovery lower. Although the WHO investigators didn't identify a reason for the stark disparity in outcomes, they had tracked antipsychotic usage in the second study, having hypothesized that perhaps patients in the poor countries fared better because they more reliably took their medication. However, they found the opposite to be true. Only 16 percent of the patients in the poor countries were regularly maintained on antipsychotics, versus 61 percent of the patients in the rich countries. This begs the obvious question: Are our meds obstacles to our recovery? In his book, Whitaker places great emphasis on a 2007 study by Martin Harrow and Thomas Jobe of the University of Illinois. Drs Harrow and Jobe tracked 64 young patients with schizophrenia from two Chicago hospitals over 15 years. After two years, those not on antipsychotics were doing slightly better based on a global assessment scale than those on these meds. Then, at the next checkpoint - 4.5 years - we find a dramatic divergence. Thirty-nine percent of those off their meds were "in recovery" and more than 60 percent were working. Meanwhile, those on antipsychotics had worsened. Only six percent were in recovery and few were working. These findings held steady over the next ten years. At the end of 15 years, 40 percent of those not on antipsychotics were in recovery and more than half working, with 28 percent dealing with psychotic symptoms. In contrast, just five percent of those taking antipsychotics were in recovery, with 64 percent dealing with psychosis. Indeed, it wasn't just that there were more recoveries in the unmedicated group. There were also fewer terrible outcomes in this group. There was a shift in the entire spectrum of outcomes. Ten of the 25 patients who stopped taking antipsychotics recovered, 11 had so-so outcomes, and only four (16 percent) had a "uniformly poor outcome." In contrast, only two of the 39 patients who stayed on antipsychotics recovered, 18 had so-so outcomes, and 19 (49 percent) fell into the "uniformly poor" camp. These are not exactly the type of findings pharm reps cite to the psychiatrists they visit. Indeed, it is fair to say that the psychiatric establishment would like this study to just go away. Indeed, Whitaker points out, the NIMH, which funded the study, never drew attention to it in a press release (which is a valid criticism) nor does NAMI refer to it on its website (which is way out in left field). The story begins in 1835 when Pierre Louis first applied the art of counting to the most common medical treatment of the day - bleeding, specifically leeching. Fifty percent of pneumonia patients, Louis discovered, died within three days on the treatment. Prior to the study, 33 million leeches were imported into Paris. Two years after the study, only seven thousand. Don't expect similar turn-arounds in this day and age. Studies that shake our conceptions tend to raise many more questions than answers, so first we need to be asking questions. This is the fourth in my series based on talking points raised by Robert Whitaker's eye-opening "Anatomy of an Epidemic." It turns out Robert Whitaker and I were sitting in the same room, at the same symposium, at the same conference. The venue was the 2008 American Psychiatric Association annual meeting in Washington DC. The session was on "Antidepressants in Bipolar Disorder." Despite the fact that at the time I was writing mainly on my illness, this was only one of two bipolar sessions I recall attending in the five days I was at the conference. Over the years, I had been expanding the range of my enquiry, which included a lot of research into brain science, as well as illnesses that backed onto and overlapped with bipolar, such as borderline personality disorder, schizophrenia, PTSD, and ADHD. Having experienced a demonstrable improvement in my mental health following a move to rural southern California about 18 months prior, I had also grown interested in the old fashioned "rest cure." So it was that on the first day of the conference, I found myself panning my video camera over a display of postcards of old asylums and spas. The old institutions had been founded on enlightened principles. They didn't become chambers of horrors till some time later. Whitaker had written quite a bit about this in his 2002 book, "Mad in America." I was moving into Whitaker's world. He was moving into mine. By two in the afternoon, I was ready to call it a day. My sleep was badly messed up, and this was no time to be a hero. Moreover, I was hardly about to be startled awake by anything new concerning an issue I had been reporting on for years. But the top bipolar experts in the field would be on the panel - two who had written glowing testimonials for my book - and I was not about to miss an opportunity to reconnect, brain dead or not. Like me, Whitaker was at the conference for other reasons than to listen to bipolar experts. In particular, he was looking forward to a session in which Martin Harrow would talk about long term schizophrenia outcomes. In the meantime, there were two or three hours to kill. As he reports in Anatomy of an Epidemic: "I figured the speakers would simply present trial results that justified, in one way or another, the use of these drugs ..."
Instead, Whitaker found himself furiously scribbling away. I'm glad one of us had the presence of mind to take notes. "The illness has been altered ... Today we have a lot more rapid cycling than we described in the first edition (which came out in 1990), a lot more mixed states than we described in the first edition, a lot more lithium resistance, and a lot more lithium treatment failure than there was in the first edition. The illness is not what Kraepelin described anymore, and the biggest factor, I think, is that most patients who have the illness get an antidepressant before they ever get exposed to a mood stabilizer." As I recall, it was not simply a matter of antidepressants making bipolar worse. Dr Goodwin also made a strong case that for many people, clinical depression is bipolar waiting to happen. The rise in the incidence of bipolar, Goodwin noted, coincided with the introduction of SSRI antidepressants. It's not just the bipolar population that is at risk. A lot of those with so-called unipolar depression cycle in and out of depression without ever becoming manic or hypomanic - until you give them an antidepressant. Then they become bipolar. Psychiatry, of course, had no "evidence base" for using antidepressants in bipolar disorder, but, Post said, the clinical trials conducted by pharmaceutical companies "are virtually useless for us as clinicians" ... Only a small amount of people, he added, actually "respond to these crummy treatments." Goodwin further challenged recent pharma studies showing the high rate of relapse once bipolar patients were withdrawn from antipsychotics, noting that the findings were only evidence that "if you suddenly change a brain that has adapted to the drug, you are going to get relapse." My interest in the whole matter was more than academic. Although it is clear that my bipolar manifested in college, it wasn't till I was 49 that I sought help. I was misdiagnosed with unipolar depression and prescribed an antidepressant which had me bouncing off the walls. Of all things, florid mania proved to be much safer than the suicidal depression I had been in. Ironically, bad psychiatry may have saved my life. But that same psychiatrist also did something right, for which I am eternally grateful. The second time out, he put me on a low dose mood stabilizer. He didn't overmedicate me or turn me into a zombie. Soon, I was on my way to a new career in mental health journalism. I haven't looked back. Most patients I have witnessed in more than six years of attending support groups haven't been so lucky. Their mood stabilizer doses were way higher than mine. Plus they were on other high dose meds. These were people in stable condition, but they never got better. Way too often, they got worse. Whitaker noticed the same thing in the patients he interviewed for his book, but he came to a conclusion I would have never considered: It was the meds that were turning these people into the permanently disabled, he claimed, not the natural course of their illness. There was nothing natural to the course of their illness once the meds structurally altered their brains. According to Whitaker, back in the old days researchers and clinicians noted that illnesses such as bipolar naturally remitted over a relatively short time. Now something different was going on, and we're not just talking about the side effects most of us know all too well. As a group, we were more depressed, more manic, more psychotic, more anxious, more stupid, and less able to function than we were before. The medications have changed our brains. And the only answer clinicians have to our meds-induced worsening of symptoms is to respond with - drumroll - yet more meds, in yet higher doses. How else do you respond to a person in distress? Take him off his meds? Alas, there is no easy answer. This is a very bleak picture Whitaker paints, but one he is fully justified in painting. I was in the same room as Whitaker more than two years ago. He wasn't making things up. He wasn't taking the speakers out of context. If only we could write him off so easily. But the facts cannot be so easily ignored. The facts - alas! - the facts. This is a slight detour from my series based on talking points raised by Robert Whitaker's eye-opening "Anatomy of an Epidemic." 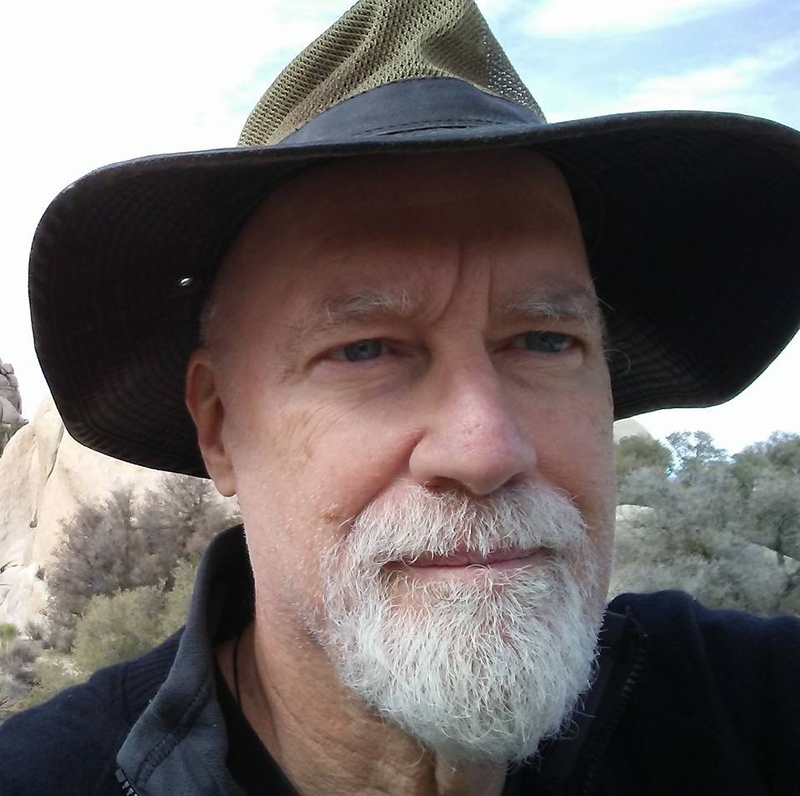 As many of you know, in July this year the National Empowerment Center, a peer-run organization that takes a dim view of psychiatry and meds, invited Whitaker (pictured here) to deliver the keynote at its Alternatives conference in Anaheim. There was one catch. The National Empowerment Center is bankrolled by the federal government via SAMHSA. SAMHSA did not like the Center's choice and disinvited Whitaker. Stupid is entirely too mild a term to describe this appalling absence of thinking. The group MindFreedom, with a strong antipsychiatry bent, organized a protest via the internet, and within two days Whitaker was reinvited. At the conference in early October, it was revealed that Whitaker's restoration had come with strings attached: He was reinstated as a keynoter, but not allowed to present a workshop that had also been scheduled. In addition, an establishment psychiatrist was invited to deliver a second keynote with the stated purpose of discrediting Whitaker, without allowing Whitaker the right of rebuttal. Stupid-stupid-stupid. The affair, naturally, raised accusations of government censorship, and the blogosphere was rife with outrage. The exception was a piece by JD Jaffe on the Huffington Post, which (after libeling Whitaker) questioned why our tax dollars were financing this sort of conference in the first place. In his own blog on Psychology Today, Whitaker interpreted Jaffe's piece to mean that certain independent-minded groups "risked losing their funding" if they did not fall into line. The point everybody missed, of course, was that this was neither a censorship issue nor an intimidation issue. When someone else is putting up the money, then that someone gets to call the shots, be it an investor, a donor, or the federal government. There is no exemption for mental health advocacy groups who claim to be the voice of the people. Pathetically, the National Empowerment Center and such groups as the California Network of Mental Health Clients could not exist for one day without federal or state government largesse, such is the sorry state of mental health advocacy in America. These advocacy groups are closely aligned with the antipsychiatry movement, whose members nurse a visceral hatred against the most successful of the mental health advocacy groups, NAMI, which Whitaker mischaracterizes in his blog as "powerful." If NAMI were truly powerful, government agencies would be quaking in their boots, mental health services in the US would be a model for the rest of the world, and our jails would not be the largest de facto psychiatric facilities in the country. Whitaker and others are on more solid ground in pointing out NAMI's heavy reliance on Pharma funding, but if money corrupts, then the National Empowerment Center and the California Network of Mental Health Clients and other groups need to send back their government checks. Then these groups need to do what real advocacy groups do - hustle for members, badger elected representatives, build alliances, offer real services, and dive under the seat cushions for spare change. Ironically, they would be wise to model themselves on the people who founded NAMI, who did just that. While I'm at it, NAMI would be wise to model itself on the people who founded NAMI. Three years ago, I requested media credentials to attend the Alternatives conference in St Louis. I was refused. For the record, I have only been refused by one other group - the Society of Biological Psychiatry. NAMI has welcomed me as a journalist, as has DBSA, the American Psychiatric Association, the International Conference on Bipolar Disorder, and numerous other organizations with nothing to hide. I could have paid the $300 or whatever Alternatives was extorting from paying customers, but then the conference would have been playing to empty seats. Mental health consumers don't have that kind of money, much less money to get there and stay there. What happens is SAMHSA picks up the tab, provided you're willing to jump through the hoops in applying for a "scholarship." Disclosure: I serve on the board of NAMI San Diego, which receives hardly any funding from Pharma. The views expressed here are entirely my own. If Meds Work As Well As Our Psychiatrists Tell Us, Then Why Do We Have MORE Mental Illness Today Rather Than Less? Anyone who has attended a mood disorders support group with any regularity cannot help but notice that a good many there are seemingly “stuck” in their recovery. These are people who are stable and not in crisis, but not well. Or, even if they manage to pass for well, are nevertheless facing major challenges in their relationships and careers. Another phenomenon involves those who turn up for the first time expressing their profound gratitude for finding the group. These are people who have very recently taken medical leave from work, but are now on an upward trajectory. They religiously attend subsequent groups, make excellent contributions to the discussions, then one day they announce they will be going back to work. You never see them again. Two streams of people - the stuck and the unstuck. Unfortunately, I have observed way too many of the former. So has author and journalist Robert Whitaker, who sat in on at least one session of a DBSA group meeting at McLean Hospital, just outside Boston. The wrap-up to the gathering, he observed in his book, Anatomy of an Epidemic, could have passed for that of a PTA meeting or a church social. Yet, as far as he could tell, despite the advanced education of most of the attendees and the fact that they were all on meds, only one in their number was currently employed. Most of the others were on disability. The fate of those with schizophrenia, we know, is far more problematic. If they are not cycling in an out of hospitals and the criminal justice system, we tend to find them in day rooms, staring blankly at TV sets, or living at home with their aging parents. But we also know there are those who do get well, who experience a remission in their illness, who are able to go off their meds, then vanish from the psychiatric radar to lead full and productive lives in the real world. What is going on? Given the advances in psychiatric care over the the past 50 years, we should be expecting huge drops in the number of mentally ill regarded as disabled. Instead, the numbers have skyrocketed - four times the disability rates for people with psychosis since the introduction of Thorazine in the fifties, according to figures cited by Whitaker. Dr Healy has conducted numerous studies pointing out the potential for antidepressants to cause harm in patients, though he himself does prescribe them, presumably with considerable caution. 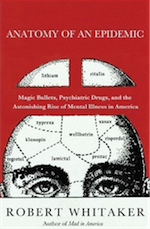 These days, even psychiatrists not named David Healy are acknowledging that our meds are hardly magic bullets and that there is a major risk of them doing more harm than good. There has been a lot of commentary on this (including on this blog), but Whitaker has gone a lot farther with his provocative and very well documented thesis that our meds may in fact be the CAUSE of a worldwide epidemic in mental illness. The conversation has just grown a lot more interesting. 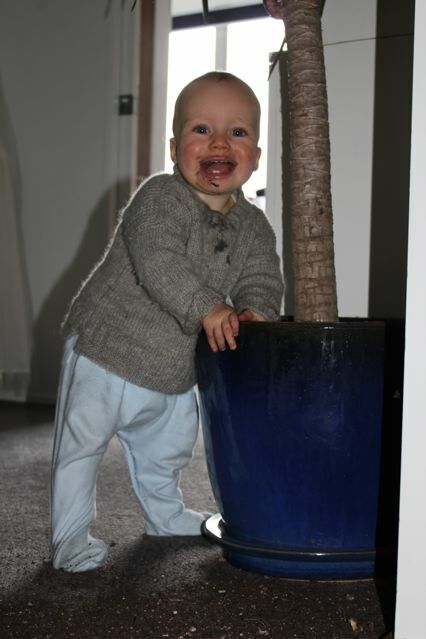 Little Teddy, one year old. "We're being told by experts to quit describing mood disorders as chemical imbalances. What metaphor or analogy shall we deploy to replace chemical imbalance?" Moira was responding to a piece I posted from a bipolar conference a couple of weeks ago where I had this to report: "We're not talking 'imbalance of chemicals of the brain,' Dr Manji reminded his audience. Instead, think of mood disorders as 'impairments of synaptic and neural plasticity.'" "The brain is like a pond. It’s like an ecosystem. You want to get the ideal ecosystem and then you don’t want to disturb it very much. ... You want to really create a stable environment." The brain, like an ecosystem, is highly complex, non-linear, and self-organizing. Both brain scientists and environmentalists describe this self-organizing principle as "homeostasis," where the system maintains its own equilibrium at a particular "set point." Robert Sapolsky in "Why Zebras Don't Get Ulcers" gives the example of perspiration to regulate body temperature. But what if we're in the desert? If we keep perspiring, we will lose water and die. Here's where "allostasis" kicks in: We stop sweating buckets, our mucus dries up. Once the crisis is over, our body reverts to normal, or - in response to changing circumstances - it may find a new set point. With "allostatic overload," we are talking system breakdown, such as what may happen with global warming or what is going on right now with the current economic-financial crisis. Allostatic overload is what happens to us when our brains fail to cope. Those of us with mental illness reach overload fairly quickly. When this happens, our brains simply don't reset to normal. We find ourselves caught in a destructive dynamic, trapped in our thoughts and emotions. Ecosystems operate on "macro" and "micro" levels. This corresponds to the "impairments of synaptic and neural plasticity" that Dr Manji was talking about. Until recent advances in brain imaging and gene technology, we had a vague macro idea of neurotransmitter traffic, which gave rise to the "monoamine hypothesis" to explain mood disorders and other mental illnesses. Of course, as Dr Sapolsky mentioned in an educational video, the brain is not "undifferentiated tofu." A serotonin or dopamine lube job is is not going to have the same uniform result in different areas of the brain. In the fMRI image, we can view how one particular pathway between two different areas of the brain is supposed to operate when things are going right. When things go wrong, that narrow arrow on the right becomes wide. 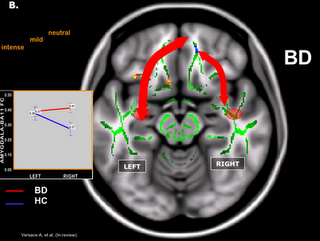 The arrows represent neurotransmitter traffic, busy and focused on the left, light and broken up on the right. Too much traffic on the right means the emotional part of the brain is dominating the conversation with the rational part of the brain, which happens a lot of the time to those of us with bipolar. When things go wrong inside, the neuron may shrivel and even die. On a macro level, when neurons go off-line and fail to communicate (via neurotransmitters) with other neurons, entire brain systems are compromised. We lose our ability to think and function. As you can guess, "macro" and "micro" are interconnected. Each regulates the other in highly intricate and virtually infinite ways. When things go right, we can only marvel at this creation of nature. When things go wrong, it's not just a chemical imbalance - it's a catastrophe, a collapse. Think "ecosystem." "By learning what happens after dopamine binds to its target neuron, we have been able to behold the brain’s inner watch works and marvel over its elegant complexity. This, in turn, is adding to our understanding of the outer watch works, namely how different parts of the brain talk to each other and how various neurotransmitter systems interact." Let me rephrase that. "Chemical imbalance in the brain" is wholly inaccurate and misleading. My book goes to great lengths to point out that our brains are not chemical soup, but I was willing to concede it was okay to use the term in a pinch. No more. Last night, I began reading Robert Whitaker's "Anatomy of an Epidemic," published earlier this year. Robert Whitaker (pictured here) is a journalist who got into reporting on mental health quite by accident. 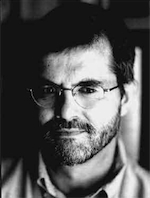 His meticulously researched "Madness in America" (2002) challenged the narrative that the introduction of psychiatric meds changed the treatment of mental illness for the better. His current book continues this line of reasoning. Psychiatric meds were developed serendipitously, with no knowledge of the underlying brain function. This is old news. The first antidepressants, for instance, were originally developed to treat TB. Some of the patients, it was discovered, became lively. In 1958, inproniazid (an MAO-I) hit the market as a psychic "energizer." A year later, imipramine (a tricyclic) came on the scene. As Whitaker reports: "The New York Times called them antidepressants for the first time." The first antipsychotics, in the meantime, came out of research for safe anesthetic agents (and before that for malaria). As part of a cocktail, one experimental med induced "artificial hibernation." In France, in 1952, two doctors used a variation of this med to quiet down psychotic patients. Very soon after, Thorazine (chlorpromazine), came on the market as a major tranquilizer or "neuroleptic" (meaning it took hold of the nervous system). Whitaker notes: "Physicians in the US similarly understood this drug was not fixing any known pathology." Only in 1963, after an NIMH study, did Thorazine and similar compounds become acknowledged as "antipsychotics". Thus the new psychiatric meds were viewed as antidotes for specific disorders, comparable to antibiotics. But to make their case, scientists needed to backfill their claims with a credible theory. Employing the equivalent of reverse engineering, researchers figured out that antidepressants worked by enhancing serotonin communication between the neurons. Likewise, antipsychotics took effect by blocking dopamine transmission. So far so good. But, could depression be seen as an undersupply of one neurotransmitter and psychosis an oversupply of another? 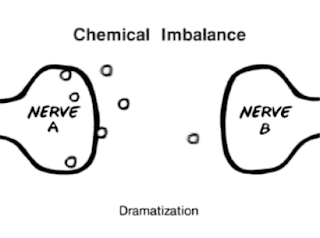 A "chemical imbalance," in other words? The obvious way to prove that was to analyze the cerebrospinal fluid (CSF) of unmedicated patients. Serotonin that is not recycled in the brain is metabolized as 5-HIAA. Likewise, dopamine is broken down to HVA. The levels of these metabolites in the CSF are acknowledged to relate to the levels of their corresponding neurotransmitters in the brain. Over the course of fifteen years to the mid-seventies, researchers found that the various metabolite levels in patients were no different than those in the general population. In other words, no chemical imbalance. This is science at its best, disproving its own claims through its own methods, though the theory kept getting revived from time to time, especially with the commercial success of Prozac. In the meantime, however, researchers began to paint a far more accurate and nuanced picture. With the administration of an SSRI antidepressant, we have learned, the brain attempts to compensate by turning down serotonin release in presynaptic neurons and reducing the density of serotonin receptors in postsynaptic neurons. This is the brain's attempt to maintain homeostatsis (equilibrium), to keep serotonin at levels as they were prior to the introduction of the drug. Only after two weeks or more does the antidepressant begin to assert itself. The brain's compensating mechanisms break down. Serotonin now floods the synapse and latches onto postsynaptic receptors. Something similar happens with the introduction of an antipsychotic. Presynaptic neurons react by pumping out more dopamine and postsynaptic neurons increase their density. Only later does the blockade begin. According to Whitaker, "the medicine clearly doesn't fix a chemical imbalance in the brain." Quite the contrary, these meds are causing chemical imbalances, and science is quite okay with that. Exhibit A cited by Whitaker is a 1996 article by former NIMH director Steve Hyman, which notes that the brain on meds is functioning in a manner that is "qualitatively as well as quantitatively different from the normal state." Psychiatric research must now extend its efforts beyond the synapse, to an understanding of cellular and molecular neurobiology (in particular, postreceptor signal transduction) as well as to a better understanding of the architecture and function of neural systems. It's a new world out there. Forget "chemical imbalance." For an alternative metaphor, check out The Brain is an Ecosystem. According to an article on Harvard’s Intelihealth: "There is some evidence that people who receive counseling and supportive therapy immediately after a trauma have a lower risk of developing PTSD than those who don't." A feature article in the New York Times Magazine by Lauren Slater, author of Prozac Diary, challenges that assumption, making a strong case for keeping trauma repressed, contrary to an industry of therapy built on prizing loose bad experiences from survivors. As early as 1952, a study found that psychotherapy in general healed no more than the passage of time, and observations coming out of 9/11 indicate that many survivors actually got worse in the hands of their therapists. The article cites an Israeli study of 116 heart attack victims, which found those who repressed the occurrence "fared better in the long run." After seven months, the "repressors" experienced only seven percent PTSD compared to 19 percent among those who sought to "lift the lid." Researchers hypothesize that repressors may perceive the magnitude of events differently, say "where you see a downpour, they see a drizzle." Another theory is that repressors are good at turning attention away from the disaster, or else believing - rightly or wrongly - that they can cope. According to Kansas City psychologist Richard Gist, who has assisted survivors of disasters but is questioning the worth of his efforts: "For all we know, the repressors are actually the normal ones who effectively cope with the many tragedies life presents. Why are we not more fascinated with these displays of resilience and grace? Why are we only fascinated with frailty?" In this blog and other outlets, I frequently refer to two studies that shed light on how our brain interacts with our environment and vice-versa. The bottom line is that those of us born with certain gene variations (say the short allele to the serotonin transporter gene) appear to be predisposed to over-react to stressful situations, which opens the floodgates to depression, anxiety, PTSD, and no end of maladaptive behaviors. A lot more research needs to be done, but it appears that resilience and vulnerability are genetic traits rather than moral virtues or defects. Technically, one may ascribe the traits to character, keeping in mind that character is heritable. 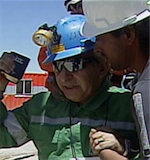 No doubt, miners possess "the right stuff" to spend a good deal of their waking lives deep inside the earth. What we have yet to learn is how much horror the resilient can be exposed to before they, in turn, become vulnerable. Two studies conducted on populations involved in the Serbian-Albanian conflict - people who reported being deprived of food and water, being in a combat situation, fleeing their homes, and being close to death - found a high rate of psychiatric disorder amongst the survivors. What surprised the researchers was how high this figure was - 43 percent, twice their expectations. Adopting less conservative criteria raised the incidence to 83.5 percent. Obviously, "get over it" and "stiff upper lip" are misguided attempts by the resilient in forcing their agendas on the vulnerable. Equally, we the vulnerable need to be mindful of ramming our therapies down the unwilling throats of the resilient. We have so much to learn. In the meantime, we have a lot to celebrate. I just finished reading Karen Armstrong's "The Case for God," which does not actually make a case for God. Ms Armstrong (pictured here) is way too smart for that. The idea of some kind of infinite absolute outside our comprehension hardly lends itself to argument, much less proof, either theological or scientific. Believe it or not, until the nineteenth century, science and religion were pretty cool with that. According to Ms Armstrong, religious fundamentalism - whether Christian or Muslim or other variety - is a relatively new phenomenon, as is most mainstream belief. A God beyond imagination does not submit to pat answers. Pat answers, in fact, are highly suspect. Define the infinite? Think about it. To define is to limit. To reduce God to our level of understanding is to lose touch with God. Scripture, which raises more questions than answers, is always open to reinterpretation. Liturgy and observances are living meditations on eternal mysteries, not empty ritual. Through immersion in a practice, through rigorous inquiry, through opening oneself to new possibilities, new realizations emerge. One becomes a better person, in closer touch with God, whatever God is. Throughout the ages, says Armstrong, religion was the means, not the end, and this applied to all faiths, irrespective of their surface differences. Even terms such as "dogma" and "belief" had different meanings and usages, more in the sense of entering into an ongoing and typically unpredictable dialogue rather than mindlessly yielding to foreordained assertions. 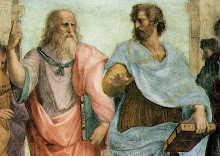 Ironically, the liberating spread of ancient Greek philosophy in the Middle Ages also gave rise to the type of stultifying over-intellectualism that would later set the scene for a hardening of attitudes. With the mass printing of Bibles, selected scriptural passages were deployed by competing faiths and sects to separate themselves out from one another. Nevertheless, maintains Armstrong, faith and science maintained a sort of working mutual accord. Neither was trying to dictate to the other. Even the Galileo controversy, Armstrong argues, was overstated. (Galileo, it seems, was spoiling for a fight.) In any event, when the dust settled, religious and scientific authority appeared to be in harmony. Newtonian physics, in fact, seemed to prove the existence of God. Some higher power had to have set the mechanics of the universe in motion. This was as self-evident to Newton as it was to the rationalist philosophers his discoveries inspired. Yes, Europe erupted into senseless religious warfare - change always exceeds society's capacity to peacefully absorb it - but with the emergence of a modern Europe came the belief that the solution to any problem (no matter how intractable) and the explanation to any phenomenon (no matter how mysterious) would yield to the power of reason. God could be explained scientifically. Organized religion was comfortable with that. The Christianity of America's Founding Fathers was very different than the Christianity we practice today, irrespective of denomination. The catch is that reason has its limits. Alas, scientific enquiry breaks down in the pursuit of that which is beyond imagination. On top of that, arid intellectualism failed to satisfy essential human needs, which set in motion a revivalist reaction. Still, no one seriously argued that Scripture trumped science. That would soon change. First, Charles Lyell showed that the earth was shaped - and still being shaped - by slow-moving forces spanning eons. Then Darwin came on the scene. Nevertheless, Armstrong is quick to point out, Darwin's ideas were readily accepted by the scientific community and not seriously challenged at first by religion. That didn't last long. Scientism extremists became anti-religious. Religious extremists became anti-science. Even in mainstream religions, new emphasis was given to the literal interpretation of Scripture, with those presumed closer to God claiming an authority they never dared lay claim to before. Thus, in 1870 the doctrine of papal infallibility was adopted by the Catholic Church. Nevertheless, by the 1960s, people were seriously asking, "Is God dead?" Mainstream church attendance was in sharp decline and religious fundamentalism was a fringe movement. A new secular culture was dawning. Well, you know the rest of the story. In the US, today, religious fundamentalism is driving much of the political and social agenda. The history lesson, Armstrong tells us, is that every threat to the old order spawns an irrational reaction, with each new religious outbreak more bizarre than the one that proceeded it. A lot of what passes for both mainstream and fundamentalist religion today, if I am reading Armstrong correctly, bears very little semblance to the religion of the past. The extremists in our midst - the likes of Dawkins and Sullivan - argue that our world would be a lot happier if we could somehow stamp out all religion and disabuse ourselves of the notion of God. But that, Armstrong argues, misses the point. Just because religion has no pat answers for God (even if they profess to offer them) does not preclude the existence of God. And religion at its best - even the ones we may find abhorrent to us - offers the prospect of bringing us closer to that which is beyond imagination. Torrey Pines, La Jolla, CA. Usually, when I sit down and have dinner all I have to worry about is where I will spill my food. But that changed about 18 months ago, when I took my seat as the new guy on the NAMI San Diego board. I made the rookie mistake of breathing too loud, and next thing I was drafted into service on the committee that plans our annual Inspiration Awards Dinner. Last year’s dinner was such a great success that I found myself, through no fault of my own, reassigned to this year’s committee. There are 800 million things that can go wrong in putting on a dinner and dinner program for 200. As you can see from the photo, none of them happened. Here I am, just after the Dinner, with John Bell, who received our Young Advocate of the Year Award. 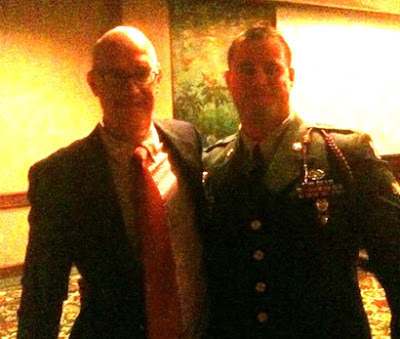 John is very recently back from Iraq, where he has served as a medic in the Army. In April, John organized a 5K run concurrent with our local NAMI walk to bring awareness to mental health issues for those who serve our country. John was a surprise guest at the Dinner, having had his leave request approved only two days before. He is currently stationed at Fort Benning, GA. It was my honor to sit at the table with John and his fiancee, Melissa. Many thanks to Annie Dunlop, NAMI SD’s development and events manager, who took the lead in organizing the dinner, our board president Lisa Ponfick and Executive Director Shannon Jaccard, Councilman Todd Gloria who MC’d the affair, our awardees, sponsors, and all our volunteers and staff who made Friday evening an occasion to remember. It was a bitter cold winter in 1963, and an American mother of two was doing her best to cope on her own in London, not long after being jilted by her husband for another woman. Poet Sylvia Plath, 30, left out bread and milk for her two toddlers sleeping in an upstairs bedroom. Then she turned on the gas. Following the posthumous publication of her Ariel poems, Sylvia Plath became a feminist cause celebre, with ex-husband poet Ted Hughes vilified as an accomplice to her death. Completely overlooked by these critics, however, was Exhibit A, the writer's very own words, her semi-autobiographical novel, The Bell Jar.
" ... with each flash a great jolt drubbed me till I thought my bones would break and the sap fly out of me like a split plant." How did I know that someday - at college, in Europe, somewhere, anywhere - the bell jar, with it's stifling distortions, wouldn't descend again? "It is here in her diaries that Plath reveals what she really thinks - about her depression, about her sexuality and about Hughes." In an early entry, she reveals her manic as well as depressive side: "God, is this all it is, the ricocheting down the corridor of laughter and tears? Of self-worship and self-loathing? Of glory and disgust?" And again: "It is as if my life were magically run by two electric currents: joyous and positive and despairing negative; whichever is running at the moment dominates my life, floods it. I am now flooded with despair, almost hysteria, as if I were smothering." On the day after she met Ted Hughes, she wrote a poem "about the dark forces of lust." Entitled "Pursuit," it begins: "There is a panther stalks me down:/One day I'll have my death of him." God, if ever I have come close to wanting to commit suicide, it is now, with the groggy sleepless blood dragging through my veins, and the air thick and gray with rain and the damn little men across the street pounding on the roof with picks and axes and chisels, and the acrid hellish stench of tar ... My world falls apart, crumbles, 'The centre does not hold.' There is no integrating force, only the naked fear, the urge of self-preservation. I am afraid, I am not solid, but hollow. I feel behind my eyes a numb, paralysed cavern, a pit of hell, a mimicking nothingness, I never thought, I never wrote, I never suffered. I want to kill myself, to escape from responsibility, to crawl back abjectly into the womb. I do not know who I am, where I am going - and I am the one who has to decide the answers to these hideous questions. I long for a noble escape from freedom - I am weak, tired, in revolt from the strong constructive humanitarian faith which presupposes a healthy, active intellect and will. There is nowhere to go - not home, where I would blubber and cry, a grotesque fool, into my mother's skirts - not to men where I want more than the stern, final, paternal directive - not to church which is liberal, free - no, I turn wearily to the totalitarian dictatorship where I am absolved of all personal responsibility and can sacrifice myself in a "splurge of altruism" on the altar of the Cause with a capital "C". Falcons Yard, and the syncopated strut of a piano upstairs, and oh it was very Bohemian, with boys in turtle-neck sweaters and girls being blue-eye-lidded or elegant in black. Derrek was there, with guitar, and Bert was looking shining and proud as if he had just delivered five babies, said something obvious about having drunk a lot ... By this time I had spilled one drink, partly into my mouth, partly over my hands and the floor, and the jazz was beginning to get under my skin, and I started dancing with Luke and knew I was very bad, having crossed the river and banged into the trees, yelling about the poems, and he only smiling with the far-off look of a cretin satan. He wrote those things, and he was slobbing around. Well, I was slobbing around, blub, maundering and I didn't even have the excuse of having written those things; I suppose if you can write sestinas which bam crash through lines and rules after having raped them to the purpose, then you can be satanic and smile like a cretin beelzebub. 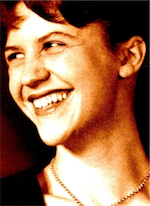 In a sense, Sylvia Plath has been restored to life, by the power of her own pen, by the power of her own words. That such a vital force was struck down by depression makes her short life all the more tragic. But her own words also portray triumph, of a woman who overcame tremendous odds just to find some joy in her life, a joy she was able to manifest in full measure. "Thrice was I beaten with rods, once was I stoned, thrice I suffered shipwreck, a night and a day I have been in the deep." Paul was on a mission, literally a mission from God. His first two Letters - Romans and First Corinthians - reflect the optimism of one with God on his side: confident, bossy, out to change the world. Second Corinthians, written many years later, reflects a different Paul: weary and disenchanted, struggling to keep his faith. What happened? We pick up the story in Acts of the Apostles, when a mob from Antioch and Iconium stoned Paul and dragged him out of the city, leaving him for dead. Acts also reports that Paul and his companions were at the mercy of a mob in Ephesus, city of the Temple of Diana. Even when Paul succeeded in setting up Christian communities throughout Asia Minor and Greece, his Letters reveal his frustration with the inadequacies of his followers. Indeed, it is clear that some of these communities were in open rebellion against their founder. And so we come to his extraordinary admission in Second Corinthians. He holds nothing back: the public floggings, the stoning, the shipwrecks, the rigors of travel, the exhaustion and privations, the personal betrayals, of being set upon by bandits. But all that pales in comparison to what is really on his mind. "I fear," he writes to his Corinthian community, "that when I come I may find you different from what I wish you to be." All that suffering - for nothing? Is that what life is all about? God, what happened? I thought Paul was Your anointed servant. I thought he had Your blessing. You presume to act in My name? Well, let's see how sincere you are after a mob has tried to crack open your skull. You think you are committed? Then let's see how committed you are holding on for dear life to a piece of boat in the open sea. You want it real bad? Let's see how bad you want it when your friends turn on you, your followers abandon you, and your love is returned in endless measure with hate. You want to spread light? Well let's see how it feels when the darkness closes in. And there you are, all alone, your life up in smoke. It's not in God's nature to make things easy. You want an easy life, then do something easy. You want to accomplish something, well don't expect any breaks. The nature of things is you will be tested. The last we hear from Paul in the New Testament is in Rome, under house arrest. "I considered all toil and all achievement," says Ecclesiastes, "and it all comes from rivalry between man and man. This too is emptiness and chasing the wind." 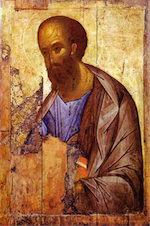 Clement of Rome reports that for all his hardships, Paul "won the noble renown." There is no surviving account of whether or not he died a martyr. Let's trust he died a man at peace. 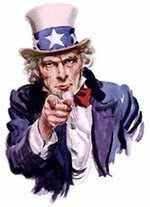 Rerun- Is Mental Illness an American Disease? The article, "The Americanization of Mental Illness," is an adaptation from the just-released book, ‘‘Crazy Like Us: The Globalization of the American Psyche.” In the article, Mr Watters uses the example of a “culturally specific” form of anorexia documented by one researcher in Hong Kong during the 80s and 90s. Unlike Americans with anorexia, those in Hong Kong simply complained of bloated stomachs without dieting or expressing fear of becoming fat. The illness was rare. In the end, what cross-cultural psychiatrists and anthropologists have to tell us is that all mental illnesses, including depression, P.T.S.D. and even schizophrenia, can be every bit as influenced by cultural beliefs and expectations today as hysterical-leg paralysis or the vapors or zar or any other mental illness ever experienced in the history of human madness. The problem, it appears, is that the biomedical narrative about an illness like schizophrenia carries with it the subtle assumption that a brain made ill through biomedical or genetic abnormalities is more thoroughly broken and permanently abnormal than one made ill though life events. Most of us are aware of three WHO studies over the course of 30 years (starting in the 70s) that found that patients outside the US and Europe had significantly lower relapse rates (as much as two-thirds lower in one follow-up). Watters reports on anthropologist Juli McGruder from the University of Puget Sound who spent years in Zanzibar studying families of those with schizophrenia. There Muslim and spirit possession beliefs are incorporated into healing practices. Rather than spirits being “cast out,” they are “coaxed out” with acts of kindness. The course of a metastasizing cancer is unlikely to be changed by how we talk about it. With schizophrenia, however, symptoms are inevitably entangled in a person’s complex interactions with those around him or her. In fact, researchers have long documented how certain emotional reactions from family members correlate with higher relapse rates for people who have a diagnosis of schizophrenia. This negativity is referred to by experts as “high expressed emotion (high EE),” which include criticism, hostility and emotional overinvolvement (such as overprotectiveness). White American families caring for a family member with schizophrenia have notoriously high EE rates, with much lower EE rates among Mexican and other families. Offering the latest Western mental-health theories, treatments and categories in an attempt to ameliorate the psychological stress sparked by modernization and globalization is not a solution; it may be part of the problem. Helen likes to show me off, because I am good at parties, can talk with anybody, good social skills. And I am cute. Anticipating wine at the function, she decided to skip her afternoon Valium. Besides, she wanted to be mentally sharp. Later into the function, the host engaged Helen and Willa in a conversation. They were standing in front of a bookcase populated with books by Iowa Writers Workshop authors. The workshop is the pride and joy of the university. In Willa's words, "That is when the evil twin appeared." Pointing to a Pulitzer book, "Gilead" by Marilynne Robinson, the evil twin let loose: "Boring. Boring, boring, boring." Gracious host that she was, Dr Mason acknowledged it was a difficult book to read. Willa says she could have redeemed herself by offering that it was difficult for her, as well. After all, the book was about depressed small town Iowa clergy, and - guess what? - Willa had been one herself. All manner of fascinating conversation could have flowed. But, no. Willa pointed to another book. As she reports: "This time I said, 'I hate this book ...'" Dr Mason moved on to other guests. Those meds would give me a flat affect, facial tics and forty pounds. Helen would have no reason to let me out of the house at all. I would no longer even be cute. Willa cites a 2003 study by Pope and Scott that pointed to a clear discordance between psychiatrists and patients. The psychiatrists in the study thought that bipolars went off their meds because we "miss our highs." The patients who quit cited other reasons. 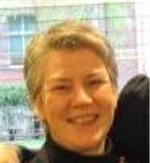 In 2006, I heard Dr Scott talk about her study at the International Society of Bipolar Disorder conference in Edinburgh. When I included it as a PowerPoint slide in a grand rounds I gave two years later to clinicians at a hospital in Princeton, NJ I was greeted with stony cold frozen Kelvin grade silence. It didn't help when the next thing out of my mouth was: "Get over it. When your patients complain to you about feeling like fat stupid zombie eunuchs on the meds you prescribe - and on the meds you overprescribe - they are not doing this to ruin your day." In an ideal world, we could all be our smart, funny, insightful, and engaging selves without having to worry about causing a social embarrassment. Operating with a clear head is our most valuable asset, but there are risks, illness or no illness. I could opt for faux pas-free life, but at what cost? An existence devoid of laughter? Yesterday, I re-ran an earlier blog post that talked about paradigms and how psychiatry is ripe for a new one. Thomas Kuhn (pictured here) literally owns the word paradigm. In his seminal 1962 book, The Structure of Scientific Revolutions, Kuhn points out that far from being an objective and dispassionate exercise, scientific research operates from existing conceptual frameworks until they are no longer sustainable. Thus Ptolemy to Copernicus, Newton to Einstein, and so on. Almost inevitably, the old order is toppled by those outside the field or those just entering the field, who have little or no stake in the status quo. A major need of psychiatry in the future is to put the psychotherapeutic arm of psychiatry on the same solid biological footing as the pharmacological aspect of psychiatry. In January, after I posted my piece for the first time, Willa challenged the notion of psychopharmacology on a solid biological footing, noting that in medicine "the paradigms dictate the treatments." Unsuccessful treatments, she said, do not challenge the paradigm. "They simply are problems to be solved within the existing paradigm." Thus unacceptable side effects induce researchers to find new meds rather than lessening the reliance on meds. Yesterday, in response to my second posting, Tony added that every FDA medication in essence carries the warning that says: "We have no idea how this stuff works, but it does... kinda, sorta a little better than a placebo..."
Obviously, we have a lot of frustrated and very well-informed patients challenging the biological psychiatry mindset in the form of the recovery movement. Had psychiatry come up with new meds that worked a lot better than the old ones, with practitioners smart enough to work with us, the current paradigm might be more secure right now. My personal view is that the biological researchers are trapped by their paradigm to look only at the brain. They cannot conceive the possibility of mental disease having any other source than the physical matter of the brain itself. By their paradigm, they not only believe that but refuse to look at any other evidence which would point to the contrary. He concludes: "The race is on. Let the best emerging paradigm win." To my knowledge, every brain scientist is operating off a genes-environment paradigm, which takes into account both biology and how we respond to the world around us. In the old days, psychiatry distinguished between biological causes to mental illness (such as neurosyphilis) and what they saw maladaptive reactions to stress and interpersonal relations. This harkens back to the old mind-brain distinction. Since we lacked the tools to see into the brain, the first DSM of 1952 classified depression and schizophrenia and bipolar and the like as "reactions" rooted in neurosis or psychosis or personality rather than biology. Biological psychiatry tipped over that Freudian paradigm, but in the process lost track of the fact that there was a lot of validity to Freud and his followers. Our behaviors are indeed shaped by our environment and buried traumas. The catch was that the only known therapy of the day - psychoanalysis - did not work for serious mental illness. Thus a paradigm ripe for tipping. The biological psychiatry paradigm naively assumed we could simply find something wrong in the brain and fix it, with no regard to environment, without being able to pinpoint cause and effect. Thus an antidepressant for depression, a mood stabilizer for bipolar, and so on. The catch was that even magic bullets are problematic if someone has to contend with an abusive relationship or a toxic work situation. The new brain science has broken down the mind-brain distinction. We now know that some of us inherit vulnerable brains that are prone to breaking down under stress, which in turn manifests as various forms of illness episodes and maladaptive behaviors. Those with more resilient genes are far more likely to take stress in stride. This new brain science validates the "diathesis-stress" hypothesis advanced during the seventies. These discoveries cut across all psychiatric diagnoses and blur the categorical distinctions, spurring researchers to dig deeper into underlying causes (endophenotype) rather than the outer symptoms of phenotype. This demands a new approach to diagnostic psychiatry, which is more likely to come from outside the field rather than from within. The new brain science has also revealed that the brain is plastic, capable of reshaping itself. In essence, the brain is software rather than hardware, and we can change the software to make us more resilient and better able to adapt to whatever life may throw our way. It also works the other way - that sustained stress and trauma can change our software for the worse. Likewise, we can change our environment. If we know, for instance, that we have a genetic predisposition to alcoholism, we learn to avoid situations that put us at risk. We now have a new model of the brain interacting with the environment and vice-versa, each capable of change, each capable of changing the other. Thus we see the beginnings of a grand unified theory waiting for the next Einstein, where Freud and biological psychiatry are reconciled, along with ancient precepts. Mind and brain are one, leading to new insights into behavioral causes and effects and possible treatments and therapies and self-help tools. This is already well underway. Those operating within the current paradigm, who simply expect brain science to validate biological psychiatry can be regarded as intellectual dinosaurs. Their days are numbered, but they won't go down without a fight. Some form of Kandel's new science of the mind will emerge and maybe it will no longer be called psychiatry. But this new paradigm, like all paradigms, will only be a temporary placeholder, awaiting a newer paradigm to unseat it, such is the nature of scientific discovery. Absolute truth will always elude us. The best we can do is proceed on the facts as we know them, with an assist from inspired speculation. This will yield us the best approximation of reality. That is, until a better one comes along.